Cloth made in the Haslital. Hand made. Touchingly beautiful. The colourful fabric with unmistakable patterns have been woven by hand since very early days. They are made by people that are connected to the mountains of the Haslital as though they were at one with them. Nature’s power can be felt in these products – a strength and vibrancy that touches the heart. Again and again. 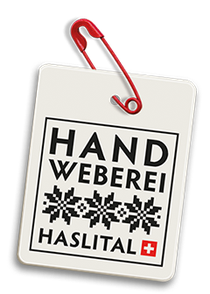 The «Haslital Handicrafts and Hand Weaving Association» aims to retain these unique handicrafts as a cultural heritage of the Haslital. Today there are still a great number of admirers of this wonderful, unique cultural treasure who are passionate about retaining this traditional Haslital handicraft. Visit our shop in Meiringen, in the heart of the Haslital. Take photos, tag them with #myhaslistern and post them on Instagram.